Central Michigan shooting guard Trey Zeigler is on Duke’s campus Friday, according to team sources. Zeigler announced he was transferring from Central Michigan on Wednesday after his father and head coach, Ernie Zeigler, was fired after the Chippewas went 11-21 last season. In two years at Central Michigan, Zeigler played a huge role in the Chippewas’ offense. He led the team in both scoring and rebounding last season, averaging 15.8 points and 6.7 rebounds per game. He will have two years of college eligibility remaining after he transfers. 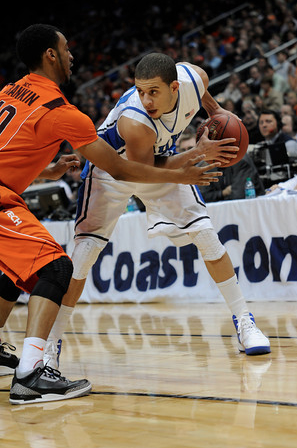 The Blue Devils are very interested in the prospect of Zeigler joining the team. Although he did not receive an offer from Duke as a high school senior, Zeigler, a native of Mount Pleasant, Michigan, was a highly touted recruit coming out of high school. Despite not receiving an offer from Duke, he did receive interest from the coaching staff and was very interested in playing for Duke during his high school career. He received scholarship offers from Arizona State, Michigan, Michigan State, Oklahoma, and UCLA before ultimately deciding to play for his father at Central Michigan. He is exactly the type of player that Duke needs. Zeigler is a long and versatile wing player, something that the Blue Devils severely lacked last season. He has the ability to handle the ball and can play point guard, shooting guard, or small forward. He can finish at the rim with the best of them, and matches up much better on the defensive end with many of the ACC’s current stars. This news comes as a bit of consolation for Duke fans, as signs are currently pointing to both Austin Rivers and Mason Plumlee departing early for the NBA. We are still waiting on official announcements from both of them as to their future plans. Duke has a great record with recruiting transfers, and rarely has one who has visited campus not ended up playing for the Blue Devils. Notable Duke transfers from the past include Roshown McLeod, Dahntay Jones, and current Duke guard Seth Curry. Curry was the last player to transfer to Duke, coming from Liberty University after the 2009 season. He sat out the entirety of 2010 before becoming eligible to play. No, the regular season did not end the way Duke wanted it to. There was no celebration, there were no championship banners, just Miles Plumlee standing at center court thanking the Duke faithful on senior night. Good news is, starting today, none of that matters. Duke saw its first action in the ACC tournament Friday night when it dispatched the 2nd-seeded Blue Devils dispatched of 10th-seeded Virginia Tech by a score of 60-56 at Atlanta’s Phillips Arena. Many call this tournament the Duke Invitational- Duke has been crowned champions of the ACC tournament in 10 of the last 13 seasons. However, this year, the road to another ACC tournament championship would be a little bit tougher. Just as the regular season ended on a bad note with a loss to Carolina, the first days of the postseason were not favorable for the Blue Devils as well. On Tuesday the team received news that Ryan Kelly would be unable to play in the ACC tournament due to a sprained right foot that he suffered during practice. Kelly was not only a crucial piece of the Blue Devils offense due to his size, versatility, and ability to hit from outside, but he was also a part of Duke’s thin frontcourt rotation. While typically utilizing a three guard attack, Duke normally only uses Kelly along with Miles and Mason Plumlee at its forward spots. Especially with the Plumlees finding themselves in foul trouble during Duke’s last few games, this meant that the Blue Devils would have to attack Virginia Tech with an undersized lineup. The Duke team that we saw on the court against Virginia Tech was different from the team we’d been watching all season. This was both good and bad. Unlike the team we’d seen knock down shots from long distance all year, Duke was not stroking it from deep against the Hokies. They only shot 5-for-26 on the game- just a 19.2% clip, half of their season average. Meanwhile, Duke played far scrappier basketball than I’d seen them play all year. They were getting it done with defense, and although they only forced 10 Hokies turnovers on the game, a little bit of hustle went a long way for Duke. It seemed as though they were everywhere on the defensive end. They were timing their switches perfectly and their help-side defense was working to perfection. It seemed as though nearly every Virginia Tech shot was a contested one, and although the Blue Devils struggled on the glass in the game’s opening minutes, they were able to pull down crucial rebounds when it counted the most. Yes, this was an ugly game. A very ugly game. The first half was close throughout, and even when Duke started to knock down shots and pull away in the second half, Virginia Tech was able to find its way back into the contest. But personally I’m willing to sacrifice some style points for fighting out a gritty win. I’d much rather win a close game by playing sound defense and hustling than by shooting the lights out and running away by 30. The shots will start to fall, but this is the type of basketball we need to be playing regardless of whether or not we’re knocking down jumpers. As we progress farther into postseason play, we’ll need to do both to beat some of the best teams in the country. But for now, I am perfectly content with playing lockdown defense while we wait for this shots to start falling. Kelly’s absence meant more playing time for Josh Hairston, who stepped up admirably off the bench and contributed 17 quality minutes. This was the most Hairston has played in a game since December 30. Although he only contributed four points and three rebounds, Hairston was a huge part of Duke’s defensive presence throughout the game. His ability to hustle on defense and body up in the paint was huge when playing with an undersized team. Especially when Miles Plumlee had to head to the bench in the first half after picking up two early fouls, Hairston’s effort was crucial to Duke’s success in this game. After not seeing very much action in most of his team’s biggest games this year, props to Josh for stepping up when Duke needed him the most. Tyler Thornton was the MVP of this game. He contributed a career-high 13 points, adding four rebounds, two assists, and three steals. But it was what he added that doesn’t show up on a box score that was most important. Tyler emerged as a floor general tonight, similar to what we saw from him earlier in the season. He controlled the pace of the game, and embraced the fact that his team would have to grind out a win. He was constantly vocal on both ends of the floor, which was crucial to Duke’s success, especially on the defensive end. Although he only registered three steals, he completely changed the game on the defensive end, knocking down many passes, providing constant pressure, and getting in the face of Virginia Tech’s star guard, Erick Green, and making him fight for every shot. Tyler was also not afraid to step up and take big shots. He knocked down Duke’s opening bucket of the game with a 3-pointer, and little did we know but that would set the tone for the rest of the game. Thornton would go on to take 16 shots, including 13 from beyond the arc, which would be too many for him, if not for the amount of open looks he was getting. For some reason Virginia Tech felt very free to rotate off of him to supply double teams, leaving him open for a lot of looks. He’ll need to knock down a few more of those open threes moving forward, but he was definitely a presence that changed the outcome of this game. This game highlighted a huge difference between Andre Dawkins and Seth Curry- Curry can still contribute when he does not score. Both of these players did not have very good games, each entering halftime without getting on the scoreboard. Dawkins was unable to bounce back, while Curry was able to fight through and make a difference. Andre finished 0-for-5 from the floor in 14 minutes. He looked lost on both ends of the floor. Seth turned it on in the second half, knocking down a huge three to get on the board and finished with nine points, six rebounds, and five assists. The Blue Devils had missed their previous 10 3-point attempts before Curry hit that shot. That kind of mental toughness is something that all of Duke’s players can take a lesson from moving forward. Mason Plumlee was his usual man-child self, but with an added twist. Not only did he manage yet another efficient game with 12 points and 10 boards on 4-of-6 shooting, he went 4-for-5 from the free throw line. He’s shooting 79% from the charity stripe in his last three games, and has made a conscious effort to improve his free throw shooting during the second half of this season. Ever since his terrible 2-for-10 fiasco against Virginia, he’s been a different free throw shooter. I know it sounds a bit scary to say it, but I actually felt confident watching Mason Plumlee step to the line against Virginia Tech. Hopefully he’s able to carry this forward- he’s definitely getting hot at the right time. It wasn’t pretty, it was very scrappy, but I think there are a lot of positives to pull out of a game that overall was not a very positive one. We showed that we could win without Ryan Kelly (keep in mind that we don’t know how long it will be until he is 100% again), we showed that we can win without hitting long range shots, and we showed that we can win by defending, not simply by outscoring our opponents. It’s a little disheartening to play inferior teams and consistently find ourselves in close game, but let’s face it, it’s tournament time. The only type of postseason game is a close game. By playing in high pressure situations throughout the season, we’re putting ourselves at an advantage over teams like Kentucky that are blowing their opponents out every night. Regardless of whether or not the other team is good enough to be playing us that tightly, learning how to win gritty, tight contests is how you have success in March. It’s time to put that to the test. Duke was able to eek out a close win against Virginia, but its safe to say that they were letting the Cavaliers play their game. Virginia slowed down the tempo of the game and kept the pace steady in half-court sets, and it showed for Duke statistically. The Blue Devils’ 61 points accounted for Duke’s lowest scoring output of the year, and it was just the first time all year they had won a game when scoring fewer than 68 points. The highest GameScore for Duke against Virginia was a mere 8.6 for Mason Plumlee, who shot an efficient 5-of-6 from the field but left quite a few points at the foul line, shooting just 2-for-10 on the game. With 12 points, Plumlee was Duke’s leading scorer, accounting for the lowest point total for Duke’s leading scorer since Tom Emma and Vince Taylor led the way with 12 apiece in a Duke loss to Maryland on January 9, 1982 in Mike Krzyzewski’s second year as the Blue Devils’ head coach. The final score of the game was 40-36. Duke scored 10 points in the second half. However, Duke’s consistency showed through against Virginia, with four players scoring in double figures the GameScores were reasonably consistent. Six of the eight Duke players that saw the floor against Virginia had GameScores between 5.1 and 8.6. It wasn’t pretty, but it was definitely a team effort out there. Although it took a little time to get started up, Duke returned to its usual form in a 73-66 win over Clemson. Andre Dawkins led the way for the Blue Devils with 24 points on 7-of-12 shooting, including 5-for-9 from behind the arc. With a tremendous GameScore of 20.0, this was the first time Dawkins had scored above 6.9 in a game in nearly a full month. The last time he accomplished that was in Duke’s win over UNC-Greensboro on December 19. But while Dawkins success was quite visible through his scoring output, some might argue that he was nearly overshadowed by the play of Miles Plumlee. Miles scored just six points, but pulled down 14 rebounds, six of them on the offensive end, in just 23 minutes. This accounted for an Oreb% of 29.81%, which statistically speaking is practically off the charts. As he continues to come on strong in the midst of his senior year, Miles can’t help but remind us of another Duke player from not too long ago. And in case you don’t remember, things turned out quite wellfor that team. Meanwhile, against Clemson Mason Plumlee played his usual Mason Plumlee game, scoring 12 points and adding seven rebounds on just an 18.55% Usage%. Mason’s performance was good for a GameScore of 9.8 as he continues to show consistency on the offensive end. Andre Dawkins is back in an upswing-After struggling for most of December and the beginning of January to the point where he often looked invisible on the floor, Dawkins is beginning to find his form again. After playing what Coach K called “his best defensive performance of the season” against Virginia, Dre exploded against Clemson in one of those classic “Andre Dawkins can’t miss a shot” games. Dawkins is playing some of the quality basketball we saw from him in the early part of the season, and at this point we just hope he can keep it up. He has the potential to be one of the greatest weapons in the ACC off the bench. This team continues to fade in and out, but at some point it just has to click- It seems as though every player on this team has gone through its fair share of ups and downs this season with the exception of Mason Plumlee and Ryan Kelly. Though that is not ideal, it is good to see who is stepping up at this point in the season. The beginning of the season was all about Seth Curry and Ryan Kelly and then Austin Rivers began to take over in December, but now with Seth and Austin struggling Miles Plumlee, Quinn Cook, and Andre Dawkins are picking up their slack. You have to think that sometime soon Rivers and Curry will get back on top of their games, and if everyone else can continue to produce this team has the potential to be very scary down the stretch. 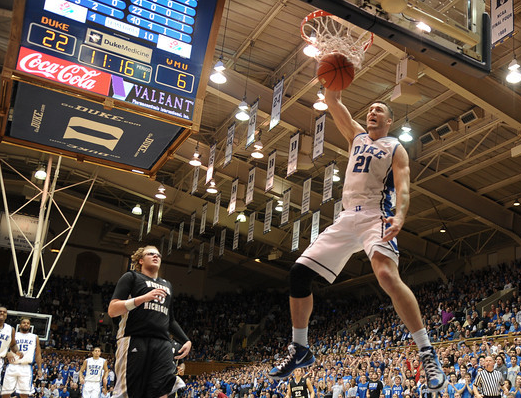 This game was all about the brothers Plumlee, but it was Miles, not Mason, who got it going early and often for Duke. Miles poured in 17 points on 8-of-11 shooting in just 19 minutes for his most productive game of the season. Miles’s GameScore of 16.6 was his season-high and was only outdone by younger brother Mason, who posted a GameScore of 18.2. Though he struggled early, Mason finally got it going down the stretch and finished with 16 points on 7-of-13 from the floor. But Mason’s biggest contribution was on the glass, posting an Oreb% of 30.17% and leading Duke with seven offensive rebounds. This means that when Mason was on the floor and Duke put up a shot, he would pull in an offensive rebound on 30.17% of these rebounding opportunities. Miles added three more offensive rebounds and recorded an Oreb% of 21.78% on the game. Unfortunately, other than the Plumlees’ performance, it was Terrible, Terrible, Terrible at Temple. Our advanced metrics actually reveal to us that Duke’s performance against Temple was even worse than it looked. The Blue Devils next highest GameScore came from freshman Michael Gbinije with 5.7- keep in mind that Gbinije only played eight minutes in the game. Gbinije was productive when he was on the floor, knocking down both of his shots for five points. After Mason Plumlee, the next highest GameScore from a Duke starter was Austin Rivers’ 3.5, thanks to his 12 points on 3-of-11 shooting. Rounding out Duke’s starting lineup was a 3.1 GameScore from Ryan Kelly, a 2.8 from Seth Curry, and a whopping 0.3 from Tyler Thornton. At risk of making myself (and I’m sure many readers) physically ill from these statistics, I’m going to slowly back away from the Temple game and pretend it never happened. But rest assured, when your team has three players with efficiency ratings over 3.5 and one of them played just eight minutes, yeah you’re in trouble. With this bad a performance, it’s surprising that Duke only lost by five points and actually had a chance to win this game. Duke’s hard-fought victory on the road against Georgia Tech served as a small step in the right direction. The Blue Devils were paced by Ryan Kelly, who scored 21 points on just four shots from the floor, posting an impressive GameScore of 20.9. Kelly’s GameScore was the highest posted by a Duke player since Quinn Cook’s21.8 against Western Michigan. Kelly’s Usage% of 20.94% was hardly indicative of his role in Duke’s half-court sets, however, as 14 of the 18 shots he took on the day came from the foul line. Mason Plumlee added another solid game, achieving a GameScore of 12.5 thanks to his nine points and eight rebounds. Curry added 15 points but was hardly efficient in doing so, taking 12 shots from the floor and posting a Usage% of 31.11%. His high usage reflected poorly in his GameScore of 8.7. In his first career start, Quinn Cook recorded a respectable GameScore of 7.5 thanks to his 10 points and five assists. Tyler Thornton, who was replaced by Cook in the starting lineup, had posted a GameScore above 7.5 on just one occasion in his six starts. Thornton’s GameScore was just 2.9 against Georgia Tech. Mason Plumlee is a workhorse— This is something that most of us already knew, but his consistency has been a great surprise this year. Plumlee has posted GameScores above 10 in eight of his last nine games. He finds ways to be a productive contributor even when he is not scoring, averaging 10.1 rebounds per game over that stretch. The Plumlees have had a history of showing flashes of brilliance but being dreadfully inconsistent, but it appears they are finally beginning to break that mold. Mason’s GameScores of 12.5 and 18.2 in the Blue Devils two most recent games, games in which the team did not play particularly well, shows that he is becoming a player Duke can rely on to produce night in and night out. Austin Rivers is struggling once again– Scoring just 20 points on 6-of-21 shooting in his last two games combined, Rivers is just not feeling it out there. We are seeing glimpses of November’s Austin Riverswho would drive the lane and force tough shots. He also hasn’t had his usual shooting touch from beyond the arc as of late, shooting just 2-of-8 from deep in Duke’s past three games. Rivers’ GameScores have been 3.9, 3.5, and 3.3 in the Blue Devils last three contests against Pennsylvania, Temple, and Georgia Tech respectively. These are his lowest totals since Duke faced Kansas in the final of the Maui Invitational six weeks ago. This seems to be the latest in a series of ups and downs this season for Rivers, but there doesn’t seem to be a larger issue here. It simply appears he’s been a bit off his game. We hope he’s due for a breakout performance very soon, especially with a tough Virginia team coming to Cameron for Duke’s ACC home opener on January 12th. Georgia Tech was a great test for Duke, who will have to grind out many more close games in tough environments as the conference schedule continues. Hopefully the Blue Devils continue to make the right adjustments moving forward. Stay Crazie, my friends. Later this week, Crazie Talk will have its first-ever mailbag where our writers answer Duke basketball questions submitted by our readers. Have any thoughts or questions? Submit them to us by sending them to crazietalk@gmail.com or tweet them @crazietalker with hashtag #askCT. Looking to rebound from a terrible, terrible, terrible loss to Temple in Philadelphia, Duke headed to Atlanta to open their ACC regular season schedule against Georgia Tech. We projected the Yellow Jackets, who were coming off of three consecutive losses to Mercer, Fordham, and Alabama, to finish 8th in the conference in our ACC preview. Despite Georgia Tech’s recent woes, there is no such thing as an easy road game in the ACC, and this game was the perfect example. The Blue Devils were able to come away with an 81-74 victory against the Yellow Jackets, but it appears Duke still hasn’t hit its stride after a hard-fought and competitive contest. Mike Krzyzewski tends to make lineup changes after tough losses, so it was no surprise that Coach K shook up the starting lineup for Duke’s ACC opener. Miles Plumlee re-entered the starting lineup for the first time since November 15 against Michigan State after a very strong showing against Temple. He replaced Ryan Kelly, who was an absolute non-factor against the Owls, playing just 19 minutes and scoring five points. 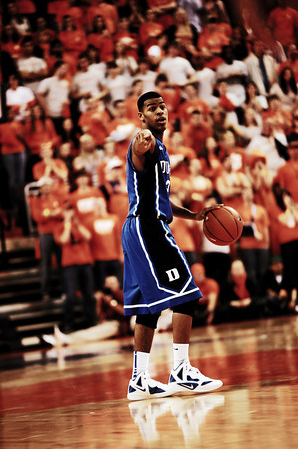 But the real story of the game was the long-awaited first career start for point guard Quinn Cook. Cook was chosen over Tyler Thornton, who had started Duke’s previous six games but whose production had diminished as of late. If you were a little worried about Duke coming into this game, you weren’t after the first 12 minutes against Georgia Tech. 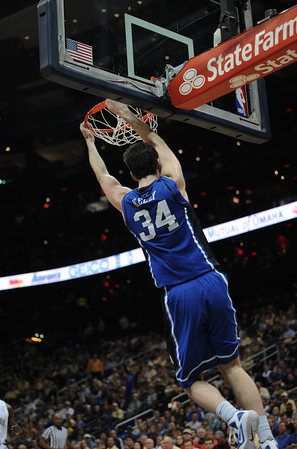 The Blue Devils jumped out to a 31-14 lead thanks to a quick start from Cook, Mason Plumlee, and Ryan Kelly. This fast start from Duke simply seemed to rattle the hornet’s nest, if you will, and the Yellow Jackets came alive. With the Blue Devils facing foul trouble early on, Georgia Tech stormed back, ending the half on a 21-8 run to pull within five. The second half was tight throughout, and with each passing minute that Duke failed to pull away, the pressure continued to mount. The Blue Devils struggled to hit shots from beyond the arc, knocking down just 6-of-22 for the game. Glen Rice Jr., who was relatively quiet in the first half, absolutely took over the last nine minutes of the game. It was as though he couldn’t miss a shot, shooting 6-for-7 down the stretch for 15 of his game-high 28 points. Georgia Tech was able to pull within two with 2:58 to go and had an opportunity to tie the game, but Mfon Udofia missed both of his shots from the foul line. After an Austin Rivers steal and layup pushed Duke’s lead back up to four, Rice had his own opportunity from the charity stripe, but he too missed both shots. Seth Curry added an exclamation point to the win, putting the game out of reach with a lob to Mason Plumlee for an emphatic finish. The Yellow Jackets’ failure to capitalize from the line combined with fantastic foul shooting from the Blue Devils sealed this tough road victory. Kelly was undoubtedly the man of the afternoon for Duke, with one of the most interesting stat lines we’ve seen in quite some time. Kelly, who got off to a hot start early in the game, shot just 3-of-4 from the field, but thanks to a perfect 14-for-14 from the free throw line led the Blue Devils with 21 points. He did not attempt a field goal for the last 16:12 of the game. Kelly’s free-throw shooting was stellar, to say the least, and it led an excellent all-around performance by the Blue Devils at the line. Duke, who has struggled with foul shooting all season, shot 29-of-36 from the free throw line on the afternoon. Although Kelly’s foul shooting preserved the win for the Blue Devils, he was not much of a factor other than the beginning and the end of this game. His first nine points came within the first 10 minutes of the game, and he scored just two points between the 10:29 mark of the first half and the 4:09 mark of the second half. Clearly this is a picky analysis of Kelly’s play, as he took advantage of his opportunities down the stretch and made sure Duke would not drop a second consecutive game, but you’d like to see him recognize when he’s the hot hand on the floor and continue taking shots. But overall it was nice to see Ryan bounce back after his worst showing of the season against Temple. 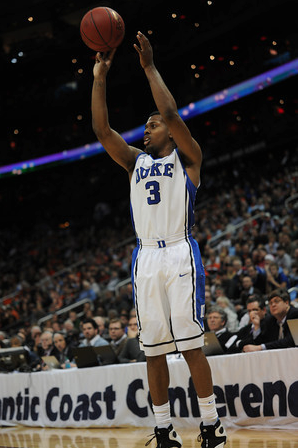 Cook played quite well in his first start for Duke, adding 10 points and five assists in 27 minutes. He commanded the floor with confidence in his first ACC contest, slashing to the bucket in the game’s early minutes and setting up teammates with crisp passes. One of the highlights of the game was his phenomenal behind-the-head dishto Austin Rivers, which placed third on DukeBluePlanet’s top plays of the game. It was a strong all-around effort, though he did take a few ill-advised shots from beyond the arc. He shot 1-for-4 from 3-point range on the afternoon and has shot just 30% from deep on the year. With five assists in the game, Cook’s assist-to-turnover ratio now sits at 4.43:1, which is the best in all of college basketball. Quinn will continue to grow into his role as this team’s starting point guard throughout Duke’s ACC schedule, but in the past few games we’ve already caught glimpses of the type of playmaker he can be. Rivers struggled yet again, scoring just eight points on 3-of-10 from the floor. This continues to be a season of ups and downs for Rivers, but you hope he is due for a breakout game relatively soon. It just wasn’t working for Austin against Georgia Tech- his shots weren’t falling and he was torched by Glenn Rice Jr. on the defensive end. He even missed two crucial free throws down the stretch that could have come back to haunt the Blue Devils. Luckily the Yellow Jackets had much larger issues from the free throw line on their hands. Although it is great to get a first ACC victory on the road, we need to address the elephant in the room here- this team is having trouble closing out games. We saw similar issues against Michigan State, Tennessee, Michigan, and Washington, where Duke allowed double digit leads to evaporate late in the game. The Blue Devils had Georgia Tech on the ropes early, jumping out to a quick 17-point lead. That should have been it right there. They should have been able to coast into halftime with a 20-point lead and let the second half play out for an easy blowout win, but they let the Yellow Jackets back in the game and suddenly had a tight second half on their hands. Luckily Duke was able to hold on, but heading into their ACC schedule the Blue Devils need to learn how to put teams away. A statistical analysis of the Temple and Georgia Tech games is coming later today. Stay Crazie, my friends. 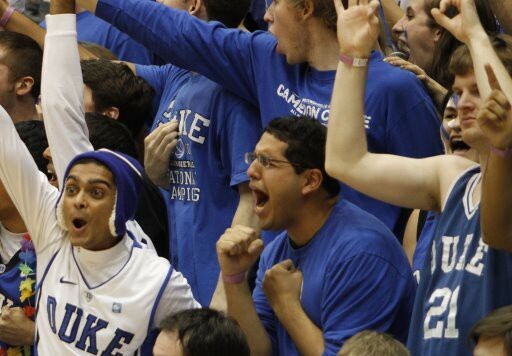 Let’s take a look at our projected ACC runner-up, the Duke Blue Devils. Starting Lineup:[table id=27 /]The Good: This team is full of offensive weapons. Duke boasts the seventh-best scoring offense in the country at 82.8 points per game. They can hit shots from all over the floor and are shooting 50.5% from the floor on the year, good for fifth in the nation. The Blue Devils have arguably the best backcourt in the country, and their guards account for one of the best shooting trios in recent Duke history. Austin Rivers, Seth Curry, and Andre Dawkins are shooting a combined 42.3% from beyond the arc this year. Their frontcourt is also significantly improved and has been dominant in recent games, headlined by junior Mason Plumlee, who has averaged 11.5 points and 9.7 rebounds on the year thanks to a new array of post moves. The Blue Devils have also played one of the toughest non-conference schedules in the country. They’ve faced three opponents that are ranked in the top 16 of the AP Top 25, defeating two of them. This was a great test for this young team, and will serve them well as they head into conference play. The Bad: Though they are much improved on the offensive end, Duke has struggled at times with interior defense this season. This was most evident against Kansas and Ohio State, when they allowed Kansas’s Thomas Robinson to go for 16 points and 15 rebounds and Ohio State’s Jared Sullinger went for 21 and eight boards. To make matters worse, the Blue Devils have had lapses inside against some of their weaker opponents. Even when the game is out of reach, this is not something you like to see a talented team make a habit. The Blue Devils have also struggled from the free throw line this season, something they cannot afford to continue as they enter their ACC schedule. Duke has shot 67.9% from the foul line this season, which is significantly below their typical standards. The Blue Devils have been one of the better free throw shooting teams in the country in years past, and haven’t shot below 68% from the line on a season since 1997-1998. Duke’s woes from the lines this year have been headlined by Mason Plumlee, who despite making significant improvements in the post this season, is shooting an abysmal 38.5%. Austin Rivers didn’t seem to get the memo that Duke guards don’t miss free throws, shooting just 69.6% from the stripe. He has vowed that he will be shooting 80% from the line by the end of the year. The Crazie: The craziest thing about this year’s Duke team is that it is continuing to come together before our very eyes. The Blue Devils lost three huge pieces of last year’s team, and has had to rebuild on the go thus far. This team was able to win at the beginning of the year based on talent alone, but in the last few games you’ve been able to see them really getting into a rhythm. It appears this team is not done making adjustments, either. When they were struggling earlier in the season, they opted for Tyler Thornton to start over sharp shooter Andre Dawkins, and now it appears that relatively soon freshman Quinn Cook will take over for Thornton as the team’s starting point guard. This is a team that is still building its image and getting comfortable playing together, but it’s remarkable how quickly they’ve gotten to this point. 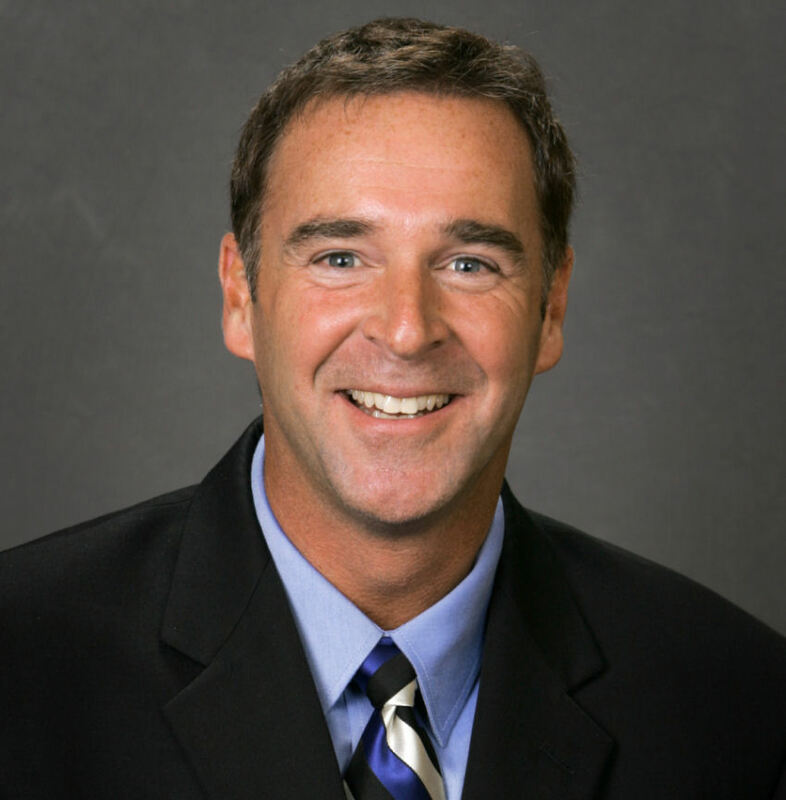 Player We Love To Hate: This is a Duke blog…we’re going to skip this one. The Bottom Line: Everyone knew the ACC was going to come down to Duke and North Carolina this year. Overall, the Tar Heels are a more experienced team and will ultimately take the regular season crown, but it should be much closer than many people expect. Duke will give North Carolina a significant challenge, and they should split their games this year, with each team winning on its home floor. The Blue Devils shouldn’t have much trouble handling the rest of the ACC competition, though they might drop a tough road game or two. They drew one of the more difficult road schedules in the conference this year, playing away at Florida State, Maryland, and Virginia Tech, which are likely the three toughest road games in the ACC outside the state of North Carolina. Although they seem to be written off by many of the “experts” for this year, this young and inexperienced team should surprise some people and contend as with Cook at point guard they continue to gel.